Discover Why Believing In God Makes So Much Sense"
In case you feel that we are promoting Theism as opposed to Atheism and Agnosticism, please be aware that another selection presented 50 reasons why people believe in God, each with a description of why each belief is invalid. "Is it Reasonable to Believe?" "Remarkably, even though millions upon millions of us do believe in God, when we are asked why we have such faith, we become tongue-tied and struggle to give a reason for our hope. No wonder those who don't believe God exists remain unconvincedâ€"there's too few of us ready to speak on God's behalf!" "Ken Boa and Robert Bowman, have provided a resource that tackles the most profound arguments from philosophy, science, sociology, psychology, and history ... and presents twenty clear, concise, and compelling evidences that show that faith in Godâ€"and specifically Jesus Christâ€"is reasonable." 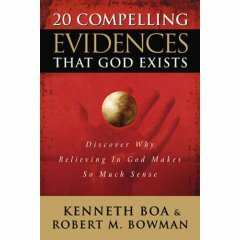 Title: "20 Compelling Evidences That God Exists: Discover Why Believing In God Makes So Much Sense "
Rating by 33 Amazon.com customers: 3.5 out of 5 stars. As is normal with religious books, most customers found the book either excellent (4 or 5 stars) or very poor (1). None were lukewarm (2 or 3 stars). "The New Testament: A historical introduction to the early Christian Writings,"
copies are often available through Amazon Marketplace. This new edition of Bart Ehrman's highly successful introduction approaches the New Testament from a consistently historical and comparative perspective, emphasizing the rich diversity of the earliest Christian literature. Rather than shying away from the critical problems presented by these books, Ehrman addresses the historical and literary challenges they pose and shows why scholars continue to argue over such significant issues as how the books of the New Testament came into being, what they mean, how they relate to contemporary Christian and non-Christian literature, and how they came to be collected into a canon of Scripture. Distinctive to this study is its emphasis on the historical, literary, and religious milieu of the Greco-Roman world, including early Judaism. As part of its historical orientation, this text also discusses works by other Christian writers who were roughly contemporary with the New Testament, such as the Gospel of Thomas, the Apocalypse of Peter, and the letters of Ignatius. The volume is enhanced by two color inserts, one on illuminated manuscripts and the other on archaeology. A Website Study Guide at http://www.oup.com/us/ehrman, offering chapter summaries, glossary terms, guides for reading, and self-quizzes for students. Ideal for undergraduate and seminary classes in the New Testament, Biblical Studies, and Christian Origins, The New Testament: A Historical Introduction to the Early Christian Writings, 3/e, is an accessible, clearly written introduction that encourages students to consider the historical issues surrounding these writings. Title: "The New Testament: A Historical Introduction to the Early Christian Writings "
Rating by 33 Amazon.com customers: 4 out of 5 stars. As is normal with religious books, most customers found the book either excellent (4 or 5 stars) or very poor (1). Few are lukewarm. 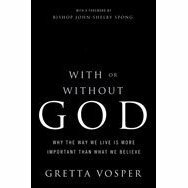 "With or without God: Why the way we live is more important that what we believe"
This book promotes a progressive view of Christianity that might just reverse the gradual decline of mainline Christianity into irrelevance. It is a best seller in Canada. Unfortunately, as of 2008-AUG-01, it is listed by neither Amazon.com or BarnesandNoble.com. See Amazon's Canadian outlet at Amazon.ca for a description. "God does not answer our prayers. Jesus is not the savior who saved the world by dying for our sins. Simply put, Christianity is â€œlove one another.â€ Gretta Vosper, founder of the Canadian Centre for Progressive Christianity and a minister in Toronto, believes that the church, as we have built it and known it, has outlived its viability. What she proposes in the provocative With or Without God is a radical change that lies at the heart of faith. The new church she envisions will play a viable and transformative role in the shaping of a future society. What will save the church from certain demise, Vosper argues, is a new emphasis on just and compassionate living. Without this reform, the church as we know it faces extinction. ..."
In a thoughtful and passionate discourse that speaks to a wide audience, Vosper tackles the issue that concerns so many of us today: how to find spiritual fulfillment, comfort and connection in the here and now. In the vein of Tom Harpurâ€™s The Pagan Christ, this is a book that dares to discard old doctrines but does so with respect and dignity. Vosper imagines a new church that leads in ethicsâ€"fostering relationships, meaning and values that are solidly rooted in our own best selves. "You have before you a confrontation. I hope it challenges you. I hope it disturbs you. I hope it changes something in you and gives you the permission to let go of some of the things youâ€™ve always thought you were supposed to hang on to. . . . I know this book is difficult. I know it will cost you much. But I hope you agree that the price is not too high if, in exchange for your losses, you help build a church that can inspire the world of tomorrow with beauty, justice, integrity and a constant yearning after truth." Gretta Vosper is the minister of the Westhill United Church in Toronto, ON, Canada, and founder of the Canadian Centre for Progressive Christianity. She received her master of divinity from Queenâ€™s Theological College in Kingston ON Canada during 1990 and was ordained in 1992. Vosper is a widely sought-after speaker and is regularly interviewed in the national media. For those of us who are NOT "comfortable" with the traditional understandings of these things this is an amazing book. For those of us who are still active in church it is challenging, even to those who might consider themselves liberal or progressive (as I do). Vosper builds on the work of recent scholars and theologians such as Spong, Borg, Crossan, and Geering, to boldly state not only what most liberal Christians believe/doubt (God is not a being, there is no heaven or hell, the Bible is not inerrant - it has good, bad and ugly bits, Jesus was not God, Jesus was not a blood sacrifice to wash away sin, etc...) but to challenge us to envision what a "faith" could look like once it jettisons all the "unnecessary" dogmatic and institutional baggage we've accumulated on our 2,000 year journey. Some of this "baggage" is as comforting as Linus' "security blanket" and will be just as hard for some people to live without! Can we no longer pray and expect God to respond? Can we no longer expect to go to heaven and see our dog Fluffy and all our loved ones? Can we no longer assume that we are the "one true" religion? Isn't Jesus the saviour of the world?? Vosper's great insight, in my opinion, which is perhaps not original to her, but she expounds the principle well, is that things like love, relationship, compassion, justice, and community have intrinsic value of their own - they don't need divine sanction to have worth. A group of humanists, working to provide better access to government services for a disadvantaged group is doing sacred work according to Vosper. God IS compassion, not some gray-bearded man in the sky. Vosper goes way beyond where I thought progressive Christianity could go in my lifetime, but that's what separates the prophets from the rest of us. This book is recommended for anyone who still holds out hope for the human community and our ability to work together "faithfully" holding to shared respect for common values such as dignity, justice and integrity. When the Christian church becomes such a community the "heaven on earth" world envisioned by Jesus will be a step closer to reality. It's comforting to know that there are those within the spiritual community who are willing to take risks. Greta Vosper has taken one of the biggest risks a Minister can by publishing a book that questions the very foundations and viability of Christianity in its present form. If you take into consideration the group of people a Minister must contend with in their work and day to day lives this makes Greta's book even more profound. Religious Zealots and those who would claim to be the protectors of age old and sacred tradtions will find With or Without God a hard pill to swallow, but it is this age old and outdated mindset that will eventual erode the foundation of Christianity. Humanity as a whole is at crossroads between the cold wonder of technological advancement and the warm comfort of faith, but time moves mountains and with each new generation the concept of God and all his trappings slides further into background of family tradition. Vosper's book shines a spotlight on the negatives and positives of organized religion and uncovers many of the oppositions one faces in trying to introduce progressive ideas to a society of followers unwilling to give up stuffy traditions and stale beliefs. Title: "With or without God"
Cost: List: $18.87 CDN. ChaptersIndigo.ca sells it for $1976 plus postage, for a saving of 34%. Rating by 71 Chapters/Indigo customers: 4 out of 5 stars. As is normal with religious books, most customers found the book excellent (4 or 5 stars) while a small minority rated it with the lowest possible rating (1 star). Nobody is luke warm. "Who Speaks For Islam? : What a Billion Muslims Really Think"
The western media does an excellent job promoting the views of the radical, violent, extremist, intolerant wing of Islam by the simple expedient of ignoring moderate and liberal Muslim voices. The views of the vast majority of Muslims go largely unreported. This book uses polling data across predominately Muslim countries to uncover the real beliefs and aspirations of Muslims. "In a post-9/11 world, many Americans conflate the mainstream Muslim majority with the beliefs and actions of an extremist minority. But what do the world's Muslims think about the West, or about democracy, or about extremism itself? Who Speaks for Islam? spotlights this silenced majority. The book is the product of a mammoth six-year study in which the Gallup Organization conducted tens of thousands of hour-long, face-to-face interviews with residents of more than 35 predominantly Muslim nations -- urban and rural, young and old, men and women, educated and illiterate. It asks the questions everyone is curious about: Why is the Muslim world so anti-American? Who are the extremists? Is democracy something Muslims really want? What do Muslim women want? The answers to these and other pertinent, provocative questions are provided not by experts, extremists, or talking heads, but by empirical evidence & the voices of a billion Muslims. " Muslims and Americans are equally likely to reject attacks on civilians as morally unjustifiable. Large majorities of Muslims would guarantee free speech if it were up to them to write a new constitution AND they say religious leaders should have no direct role in drafting that constitution. Muslims around the world say that what they LEAST admire about the West is its perceived moral decay and breakdown of traditional values -- the same answers that Americans themselves give when asked this question. Muslims say the most important thing Westerners can do to improve relations with their societies is to change their negative views toward Muslims and respect Islam. The research suggests that conflict between Muslims and the West is NOT inevitable and, in fact, is more about policy than principles. 'However,' caution Esposito and Mogahed, 'until and unless decision makers listen directly to the people and gain an accurate understanding of this conflict, extremists on all sides will continue to gain ground.' Who Speaks for Islam? is an important book that challenges conventional wisdom and sheds greater light on what motivates Muslims worldwide. It is a must-read for anyone committed to creating peace and security in our lifetime." Bruce Chilton is the Bernard Iddings Bell Professor of Religion at Bard College in Annandale-on-Hudson and Rector at the Church of St. John in Barrytown, New York. He is the author of many scholarly articles and books, including the acclaimed Rabbi Jesus and Mary Magdalene. Title: ""Who Speaks For Islam? : What a Billion Muslims Really Think"." Rating by Amazon customers: 3.5 out of 5 stars. As is normal with religious books, most customers found the book excellent (4 or 5 stars) while a small minority rated it with the lowest possible rating (1 star). "Beyond Tolerance: Searching for Interfaith Understanding in America,"
The creation of this website was triggered in 1995 by news of the genocides in Bosnia Herzegovina, perpetrated mainly by Bosnian Serb Christians against Muslims. Our goal at the time was to encourage people to promote religious tolerance: i.e. to accept the right of every individual -- within reasonable limits -- to freely follow their own spiritual path, to change their religion, and to proselytize. We continue to feel that tolerance of people of other faiths is infinitely better than exterminating or oppressing them. But we need to go much further. Tolerance is merely the first step. We strongly recommend this book! "True dialogue, as the title claims, means moving beyond tolerance, approaching other religious traditions with a desire to learn and, perhaps more important, to make friends. Niebuhr tells memorable stories of people reaching across religious lines, from a group of Cape Cod Congregationalists who gave a Jewish community a historic building, some land and some money to create a synagogue to the energetic individuals who founded Louisville's famous Festival of Faiths. Niebuhr beautifully honors the commitment and care shown by those working on the front lines of interreligious understanding." "Gustav Niebuhr's remarkable and absorbing Beyond Tolerance comes at a time when religious fanaticism, with its perversion and violence, has emerged as a threat to civilization. Anyone involved or at least interested in dialogue among individuals, communities, and nations, will benefit from its wisdom and humanity." The United States is the most religiously diverse nation in the world and the most religiously diverse collection of people in history. And even in this age of increasing religious violence, there is a growing movement of cooperation: thousands of devout worshippers who are willing to take a gamble on people of radically different faiths. In this insightful, deeply felt examination of the nature of community and religion, former New York Times religion reporter Gustav Niebuhr traces the roots of religious freedom in America and the setbacks and triumphs it has encountered along the way. From Hindus and Quakers in Queens to Catholics and Jews in Baltimore, to black Baptists and Catholics in Louisville, to Catholics and Buddhists in Los Angeles, Niebuhr focuses on the ways people build ties between groups. He looks at why this movement is a particularly American endeavor and how it can save us all. Beyond Tolerance is a handbook for religious cooperation in our fractured times. His book won the Unitarian Universalist Association's 2008 Melcher Book Award. going on all around us, as Niebuhr says, 'beneath the public radar'." Catholics and Buddhists in Los Angeles, California." Gustav Niebuhr is the former religion reporter for The New York Times and is currently an associate professor at Syracuse University. He has written for The Washington Post, The Wall Street Journal, and The Atlanta Journal-Constitution. He is a frequent commentator on NPR's All Things Considered. Title: "Beyond Tolerance: Searching for Interfaith Understanding in America." Cost: List: U.S. $25.95. Amazon.com sells it for $17.13, a saving of 34%. Rating by 2 Amazon.com customers: 3.5 out of 5 stars. As is normal with religious books, most customers found the book either excellent (4 or 5 stars) or poor (1 or 2 stars). Few are lukewarm. 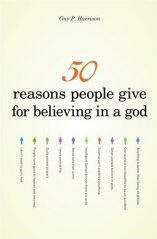 "50 Reasons People Give for Believing in a God"
The title of this book is a little deceptive. The author presents reasons why people believe in a god and then attempts to prove the reasons invalid. "Many books that challenge religious belief from a skeptical point of view take a combative tone that is almost guaranteed to alienate believers, or they present complex philosophical or scientific arguments that fail to reach the average reader. Guy P. Harrison argues that this is an ineffective way of trying to encourage people to develop critical thinking about religion. In this unique approach, Harrison concisely presents fifty commonly heard reasons that people often give for believing in a god. Then he raises legitimate questions regarding these reasons, showing in each case that there is much room for doubt." "From religion as the foundation of morality to the authority of sacred books, the compelling religious testimony of influential people, near-death experiences, theories from intelligent design, and much more, Harrison respectfully describes each rationale for belief and then politely shows the deficiencies that any good skeptic would point out. He also offers something in return--a hopeful and optimistic view of science, the universe, and humanity without the divisiveness, prejudice, and hatred caused by conflicting religious doctrines." "Drawing on his experiences as a nonbeliever and his extensive travels around the world, Harrison makes poignant arguments that are sure to inspire thought-provoking discussions. Whether you're a believer, a complete skeptic, or somewhere in between, you'll find his review of traditional and more recent arguments for the existence of gods refreshing, approachable, and enlightening." "There may be 50 ways to leave your lover, but now Guy Harrison has given us 50 ways to believe in God, or not if you care to read this engaging and enlightening book in light of what it says about the cultural and psychological power of belief. If the number one predictor of which God someone believes in is what culture and time period they happened to have been born in, what does that say about the actual existence (or not) of a deity? Read this book to explore the many and diverse reasons for belief." "Guy P. Harrison has written a persuasive and frequently humorous book about an important topic . . .This thoughtful work should be read by religious practitioners, political leaders, and the general public and should be taught as a foundation for explaining the role of religion in society. I recommend it heartily." "Deep wisdom and patient explanations fill this excellent book. The author--a journalist with worldwide experience and thorough scientific knowledge--doesn't ridicule supernatural beliefs. He seems fond of believers. But he quietly employs logic to show that invisible gods, devils, heavens, hells, miracles and the like belong in the superstitious past, and cannot be taken seriously by educated modern people." "Religion is as universal as language, which hints at a biological basis. Why did our ancestors evolve an attraction to the supernatural? The fundamental question is not whether this attraction is rational or not - which is the subject of a dozen recent provocative books -- but what exactly faith delivers to those who possess it. The present book treats this question respectfully, listening to the answer of the believers themselves, which seems an excellent place to start." Guy P. Harrison is an American journalist living in the Cayman Islands. He is a graduate of the University of South Florida with degrees in history and anthropology. Harrison is a past winner of the Commonwealth Media Award for Excellence in Journalism. He has also won international awards for his photography. Title: "50 reasons people give for believing in a god"
Rating by 22 Amazon.com customers: 4.5 out of 5 stars.